I was still a small boy when I first heard Muhammad Ali’s infamous declaration that all the world heard. And remembered. It was the bellow of self-esteem that came deep from within Ali. It struck me deep in the heart. I took him at his word. There was no question. In February 1964, there was no Civil Rights Act officially enacted until later that summer. I didn’t think I needed one of those. I never thought I couldn’t be anything I wanted to be. But that’s because I hadn’t heard my first of many “no’s” in my life. And so I needed to hear the first affirmative. My resounding yes. And it came from Ali. I was a kid in San Francisco, who grew up in all the city’s finest ghettos and had best friends in 1st grade that included African Americans and Chinese Americans (we had the best kickball team in the school yard). I had come to love boxing and revere boxers as many Filipinos do. I remember watching the fights on black and white TV. Emile Griffith was a favorite. We shared initials. But it was the Filipino boxers my father talked about. There was Speedy Dado, Diosdado Posadas, who was the same age as my dad. 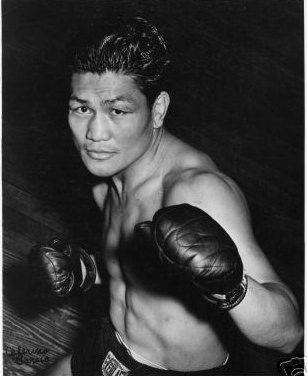 He was one of the few Filipino champion anything, Bantamweight champ in 1931 in California. And then there was Ceferino Garcia, who fought for the middleweight crown in Madison Square Garden in 1939 and held the title for seven months. Garcia was known for the bolo punch, a combination hook and uppercut that sliced opponents like a Filipino knife. He later became better known for being the driver and bodyguard for Mae West. So boxers had cred with my family. But no boxer, no athlete period, ever did what Muhammad Ali did. He stood up and fought for us all. My father loved the San Francisco Giants and Willie Mays. But outside of Jackie Robinson, no one’s fight in baseball or any team sport took on a personal and political dimension like a boxer of the stature of Muhammad Ali. He was literally fighting for all of us. No matter where you were in the continuum of the white racists’ hit parade, from Blacks, Latinos, to the Chinese (excluded 1882), Japanese (excluded by the so-called “Gentleman’s Agreement of 1907”), and Filipinos (excluded in 1934 by the Tydings-McDuffie Act), one man stood up for all of us. That’s why Muhammad Ali is so important. Yes, the draft fight was important. Yes, the name change from Cassius Clay was important. Who was speaking for us, Speedy Dado? Ceferino Garcia? They were just memories. But there was Ali, who stood fearlessly. And loudly. Given the time, it was the message the world needed to hear. We could stand up. Speak out. Have courage. It’s what a Filipino kid from San Francisco in the ’60s needed to believe.